Dating back to prehistoric times, knot theory has been used to record information, create the shelter and transportation methods necessary for survival, and adorn artwork all over the world. In modern life, we encounter knots on a daily basis, in more places than just our shoes. Inspired by these everyday knots, mathematical knot theory focuses on knots whose ends are joined together and cannot be undone. Since the 19th century, over six billion knots and links have been classified. 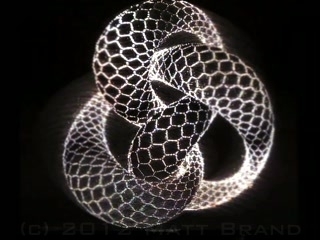 Today, knot theory, a branch of topology, is used to help us understand statistical mechanics, quantum computation, pharmaceutical design, and even our own DNA. Students are introduced to the mathematical theory of knots through group activities that have them making human knots with their own bodies! This hands-on activity will also introduce students to the way in which rudimentary knots are formed, along with the basic tools of knot theory. Students are introduced to the “unknotting number,” a fundamental invariant used to tell the difference between knots. This hands-on activity will teach students how to compute unknotting numbers by undoing basic knots made out of themselves!